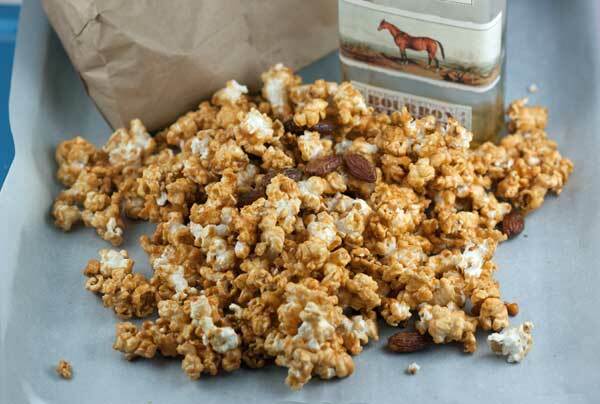 Bourbon Caramel Corn is an oven baked caramel corn recipe with bourbon thrown in right before baking. Preheat oven to 250 degrees F. Grease a large roasting pan with some extra butter and put the popcorn and whatever nuts you are using in the roasting pan. Set the pan in the oven as it’s preheating to keep the popcorn warm while you make the sauce. In a small saucepan, heat brown sugar, butter, corn syrup and salt over medium heat, stirring often, until it begins to boil. Boil for 3 minutes more, stirring occasionally. Remove from heat. Stir in bourbon/vanilla mixture (mixture will fizzle up quite a bit, so be careful) and baking soda (mixture will foam up a bit). Pour over warm popcorn and stir so that it’s evenly coated. Bake for 1 hour, stirring ever 20 minutes. Empty onto a parchment lined baking sheet or other cool surface and let corn cool completely. Note: The caramel mixture is looser and soupier than usual due to the bourbon, but the syrup will thicken as it cooks and popcorn should crisp as it cools.